Bob and I married in September 1998. Our first Thanksgiving was spent in Virginia with John (Bob’s brother) and Dorothy. During the next eleven years, we would spend five more Thanksgiving holidays with John and Dorothy. Of the remaining six years we spent three Thanksgiving holidays in New Hampshire with Cynthia (Bob’s sister) and Larry, one Thanksgiving Day at my parents’ home, one Thanksgiving holiday in Niagara Falls, Canada, and one Thanksgiving Day at home. Since 1998 each Thanksgiving Day was spent with family, except in 2008. Bob and I ate Thanksgiving Day dinner that year at TGI Friday’s in Niagara Falls, Canada. This year Bob and I spent the Thanksgiving holiday in SE Pennsylvania. We ate Thanksgiving Day dinner at the Concordville Inn Restaurant in Concordville, PA. I’m getting ahead of myself, though. Let me begin at the start of this year’s Thanksgiving vacation. This year’s Thanksgiving vacation began on Tuesday, November 23. We got an early start to the day. It was not yet 6:30AM when we departed Warren en route our hotel in Concordville, located in SE Pennsylvania approximately 30 miles outside of Philadelphia. Our first stop was in Clearfield at the Dutch Pantry, where we ate a full breakfast. We made only one other stop, for gas, en route our hotel. We arrived at the Best Western Plus Concordville Hotel at approximately 1:00PM. We stayed at this hotel last year, over Memorial Day weekend, when we visited Longwood Gardens for the first time. The hotel is set back from the road with a pond and trees. The hotel is surrounded by busy highways (Routes 322 and 1); however, when on the hotel grounds it feels like you are in the country. Our hotel room was similar to the room we had last year, but larger. The room we had last year was large too, so this room was especially large! The bathroom was large too. It had a shower AND a jacuzzi. The jacuzzi was not expected; it was a nice bonus! Furnishings included a king-size bed, two night stands, a chair with an Ottoman and a side table, love seat with small coffee table, color TV sitting atop a 3-drawer dresser, a desk and chair, microwave, refrigerator and sink. Our room was located on the fourth floor at the front of the hotel. The hotel lobby was decorated for Christmas. We relaxed in our hotel room until approximately 3:15PM, when we left for dinner. We ate dinner at Bertucci’s Italian Restaurant. We each ordered Chicken Parma (breaded chicken filets topped with Pomodoro sauce, fresh basil and melted provolone over spaghetti), served with a side salad and rolls. Bob had one beer; I drank ice tea. The staff kept apologizing for the chaotic state in the restaurant. We didn’t notice anything unusual. Apparently some of the waitresses were sent home early, as it wasn’t busy. Soon after they left, it got busy. Our meals were delicious. We felt that the service was excellent. We felt well looked after! We spent rest of the evening, after dinner, relaxing in our hotel room. On Wednesday, November 24, we enjoyed a complimentary hot breakfast at our hotel. We each ordered a made-to-order omelet, along with bacon or sausage. A host of other breakfast goodies were available as well. After breakfast we drove to Brandywine Park in Wilmington, Delaware. The park is located less than 20 miles from the Best Western Plus Concordville Hotel. We enjoyed a walk along the Brandywine River, while we waited for the Brandywine Zoo to open. I like how the sun’s rays show through the branches of the tree and how the sunshine makes the water glisten. There are many, many Japanese cherry trees on the grounds behind this fountain. I would love to return to Brandywine Park in the Spring! The zoo opened at 10:00 AM. Brandywine Zoo dates from 1905; it is Delaware’s only zoo. The zoo is small, and admission was only $4.00 each. 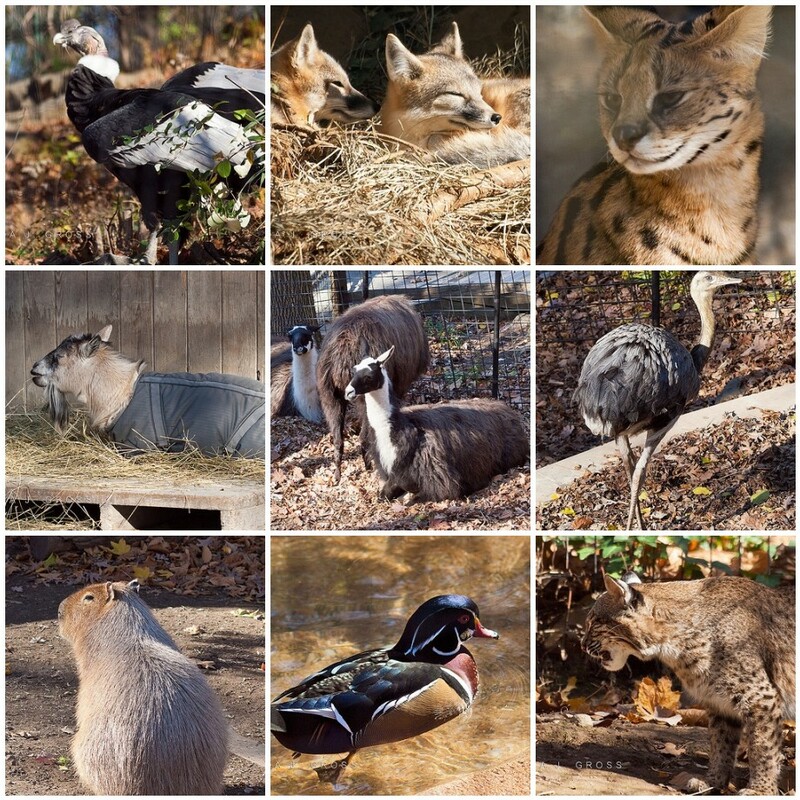 According to its website, the zoo is home to 150 animals. It is a nice zoo; however, I did not find it conducive to taking photographs. Each animal was housed in a cage. I find it difficult to photograph an animal through bars and exclude the bars in the photograph! Soon after leaving Brandywine Zoo four helicopters appeared in the sky above us. At first we didn’t know what was going on. We soon learned that a tractor-trailer had overturned on Interstate 95, spilling its load of gravel on the roadway. Not wanting to be involved in a traffic snarl, we decided to explore more of Brandywine Park. The Sugar Bowl, so named because of its lid-shaped domed roof, was originally constructed in 1902. It once stood as the entrance to the Brandywine Zoo. The Sugar Bowl is being reconstructed. We are thankful that when we left Wilmington that we had no traffic problems. We ate a late lunch at McKenzie Brew House in Concordville, PA. Bob enjoyed a couple brews, while we dined on McKenzie wedges and a wood oven pepperoni pizza. We returned to our hotel after lunch. We spent rest of day in our hotel, relaxing. We didn’t have to go out for dinner, as we had leftover Chicken Parma from Tuesday’s dinner in the refrigerator. In my next blog post, I’ll write about how we spent Thanksgiving Day.